This guy right here. Love. Him. We’ve been home all week, with only the trip to the Medstop for a diagnosis of strep and by the pharmacy for the stuff to make us better. Today I encouraged the littles to go outside and burn off some energy, as they are both a little stir crazy now that they’ve reached that point of feeling some better but still running a little fever. This is what my little guy decked himself out in this morning. 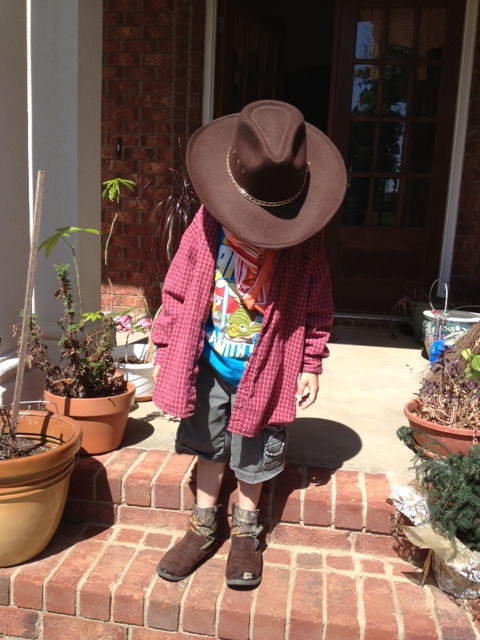 Today it has been all about cowboys and that hat my folks gave him. And those boots. I swanee, they are a mess. Yes, that’s a hole almost worn through you see there. But he loves them. So we got into a conversation about bandanas yesterday. Last night he found one and asked to have it tied around his head ninja style. He was quite the sight, darting around “like a ninja.” Seriously, were there steroids in that antibiotic? This morning he switched up styles and went cowboy on me. “Mama, Cap carried a bandana didn’t he?” he asked, thinking about my Daddy. “Well I want to carry one too.” So then he tried to fold and cram that big bandana you see around his neck into his pocket. Yeah, that didn’t go so well. He got frustrated. So I went to pull out the sewing machine that didn’t make an appearance last week for Prom Night, and I found a “fat quarter” with cars on it. I figured if I cut it in fourths it would be about the right size for him to fold and put in his pocket. As I cut and ironed, I thought about Daddy’s bandanas. He got a new set every year for Christmas from my great Aunt Hattie. It was a great gift because he did use them every day. Except for that brief time in the late 70’s when he wore it around his head Willie Nelson style, he carried one in his back pocket. Every morning as he got dressed in his standard short-sleeved button down shirt and jeans, he tucked a clean bandana–usually red but sometimes blue–into his pocket. He used it for everything from little one’s noses to cleaning little hands when they were playing outside. It was a part of who he was. When we were gathered with family and friends at the house before his graveside service, my sister came out from Mama and Daddy’s bedroom with a small stack of them. “Here,” she said, “you might need this.” One of my cousins took one in her hand and smiled through her tears. “He always carried one. Thank you.” Yes, it was something of a trademark of his. The bandana in the back pocket and a pocket knife, a pocket watch, and a little magnifier in his front pocket. So it tickles me to see my little guy who adored Daddy take such an interest in carrying one. Will I make you a special one bud? You bet I will. The car fabric was appropriate, as that was his thing with Daddy. They both loved cars. Daddy had nicknamed him Cooter, after the mechanic from the Dukes of Hazzard. They went from playing with Matchbox cars on the floor before Daddy got sick to Cooter driving them around the hospital bed rails where Daddy was in the living room. They had the same conversation every time. “Cap, is this a FAST car?” And based on engine power, make and model, the speed would be assessed. Each time, I would ask, “Daddy is that bothering you?” He always answered no, as my little fella drove that car around and around the bed. When Cooter was old enough to talk, he would always stop at the Matchbox display in whatever store we were in (did you know that the GROCERY stores sell these things? ), and ask to get this one or that one for Cap. Well, since you’re going to share…..yeah, not always, but I’d usually give in. We were at the grocery store last week and he stood looking at the cars. He sighed, “If Cap were still alive I’d get this one for him.” Ummm, well, yes, it came home with us. How could it not? After the ironing and stitching I presented him with the final product. The fourth one is already in his pocket. His little eyes lit up, and he grabbed one and put it in his pocket. “You know what, if someone hears me sneeze and they say, ‘Oh do you want a tissue?’ I will pull this out of my pocket and say, ‘No, I’ve got my bandana. '” Oh that smile. What else you want baby? Tonight I’m thankful for a little boy who has turned my world upside down. Thanks to him I find Star Wars action figures and cars in my purse or sweater pocket on a regular basis. My sister had the forethought to have some of Daddy’s old bandanas stitched up as woobies (something you hold to bring comfort), and I give thanks for her gift and my woobie. I’m thankful for my day being interruptible so I could go down memory lane and help a little guy honor his grandfather he loves so much. And most of all, I am thankful for the example my Daddy set of what a true gentleman is like, and that my little guy is remembering those things. Now I’m off to hide the pocketknife of Daddy’s he’ll get one day. So not ready for that! Now I’m crying! This is just perfect. Every little bit. Does anyone have a handkerchief??? Thank you for your sweet words. 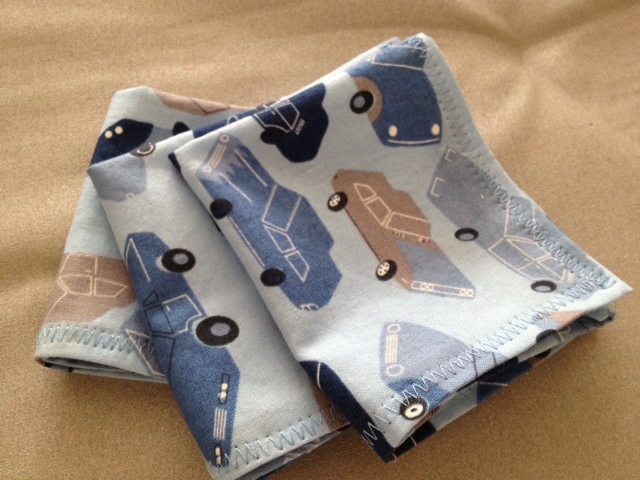 And of course we can share our handkerchiefs with you! I expect you have cars in your purse too, am I right? Oh, these little ones! I have recently discovered the Kroger Matchbox display for my little fellow. He’s been crazy about cars since his eyes could focus! What a great day! Feel better – and we will pretend my big boy might not have been the source of those strep germs…. Sorry! No worries. I am sure he was not. And yes it was a good day! Thank you. I have so enjoyed reading your posts. Those bandanas are cool, and my dad uses them too (well, those and handkerchiefs). LOL! I don’t know how many he’s given my boys over the years b/c they had to have one like Granddaddy’s. LOL! 🙂 Thanks for sharing your memories and thoughts. Sherrie, thanks for reading and for sharing your story. Isn’t it precious to see them loving on our Daddies? Thank you for your kind words and encouragement. So sweet! Keep ’em coming, my friend. From Shanghai…. Loving this blog!